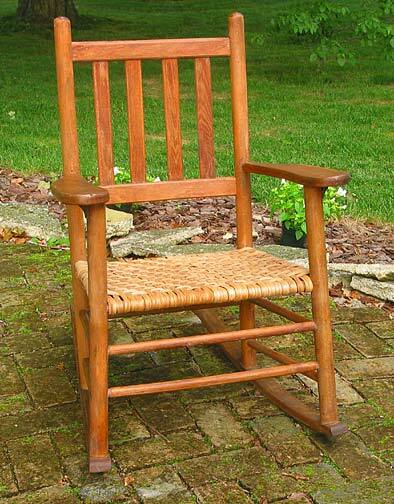 Hickory bark, a traditional chair seating material, is beautiful and long-lasting. A 35 yard bundle (5/8" to 3/4" wide) will seat one average-size ladder-back chair (approximately 15" x 13"). A rocker as shown below takes about 40 to 45 yards of bark. 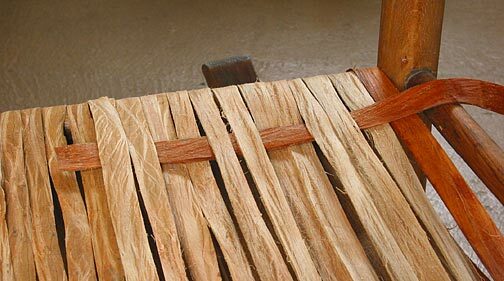 Hickory bark for chair seating may be purchased at The Basket Maker's Catalog - check current prices for hickory bark. 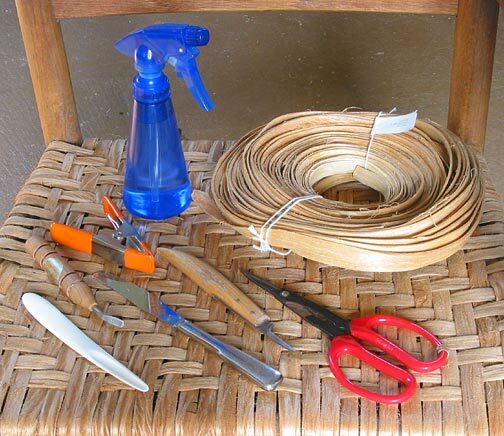 The following instructions include terms used in loom weaving. First wrap the chair front to back - this is the warp of your chair. 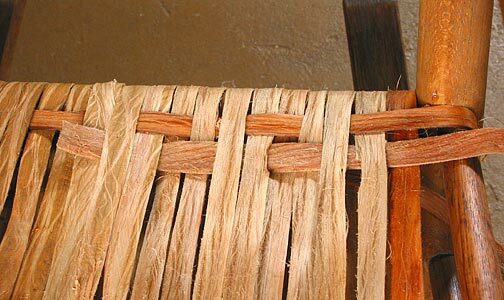 Then weave across the chair with a simple twill weave - this is the weft of your chair. 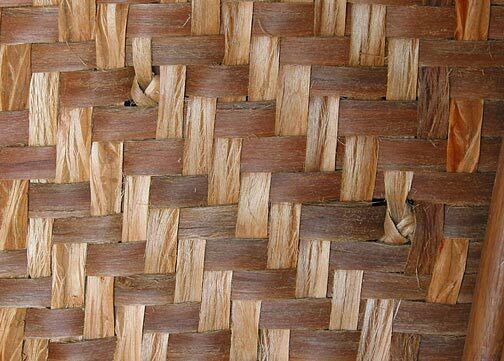 A twill weave, or herringbone weave, is woven over 2, under 2, over 2, under 2, etc. With each row you will offset the pattern by one stitch, producing the characteristic diagonal lines of the weave. The left of your chair will be your left side as you look at the chair from the front. These instructions may be used for seating a chair with any flat material (including reed, shaker tape and binding cane). NOTE: These instructions may also be used for seating your chair with Flat Reed. The only difference is the splicing. See the instructions below for how to splice flat reed. Tools needed for the job (left to right): Bone folder, packing tool, spring clamp, spray bottle, dinner knife, carving knife, scissors and hickory bark. Remove the old chair seat; clean the chair and sand if needed. Repair any broken rungs and apply the finish of your choice. We used a wipe-on polyurethane. Soak hickory bark for 15 minutes and test for pliability. Soak 10 or 15 minutes more if needed. Do not soak bark longer. 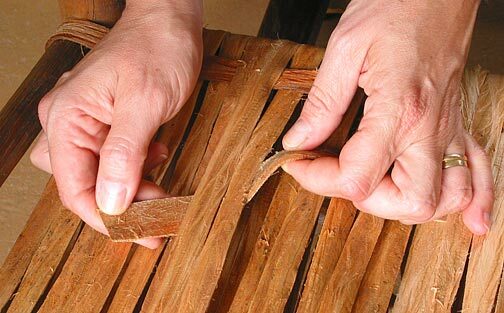 Examine the edges of each bark piece before weaving it into your chair. If you find any splinters along the edges trim them with scissors so the edges are smooth. 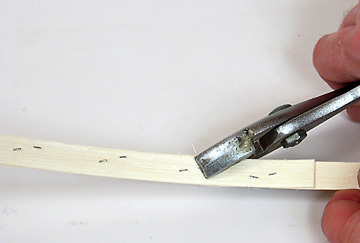 Warping: Tie bark to the left side of the back rung. Position the concave side of the bark upward (this will be the inside of the seat, the part of the bark that is not visible on the completed seat). Notice the tail of bark that becomes the knot is passed under the rung and then over the rung before you make the knot. 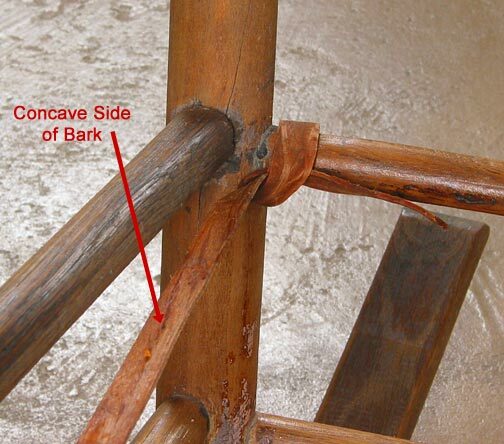 The bark may curl slightly when dry so it is important that the curl (concave side) be facing to the inside of the chair bottom. Tighten the knot and let the tail rest against the back rung. 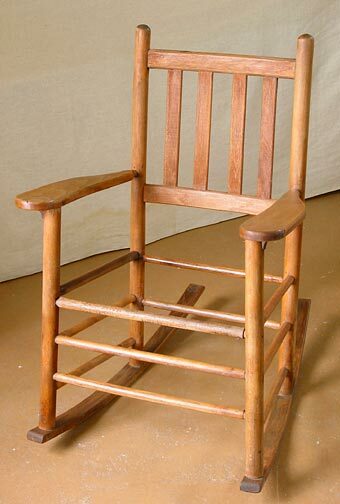 Most chairs, as in this rocking chair, have a front rung that is wider than the back rung. You'll warp the bark from back to front leaving spaces on either side of the front rung where you'll fill in with bark later. Bring the bark under the front rung and over the back rung covering the knot. Keep the bark at a right angle to the front and back rungs. Continue this process until you reach the end of your piece. 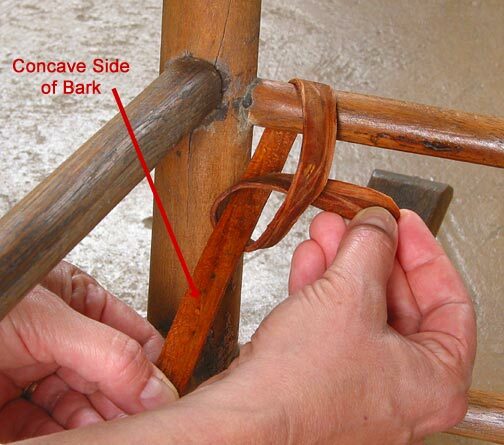 Keep the edges of the bark touching each other and use a spring clamp to keep your bark from slipping as you proceed. Note: The bark will shrink lengthwise as well as across the width. Keep an even tension but do not pull the bark too tightly as you warp the seat. If you warp too tightly the bark will pull and bend the rungs as it drys and shrinks. 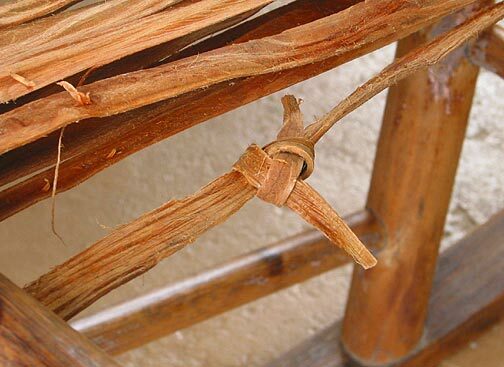 "Weaver's knot" splice: When one piece of bark comes to its end, cut the bark so the end is at least 7 or 8 inches long on the under side of your chair. Then trim the last 5 inches of the bark to about half the original width using a sharp knife or scissors. Trim the first 5 inches of your new piece of bark to about half the original width (just like the end of your old piece). 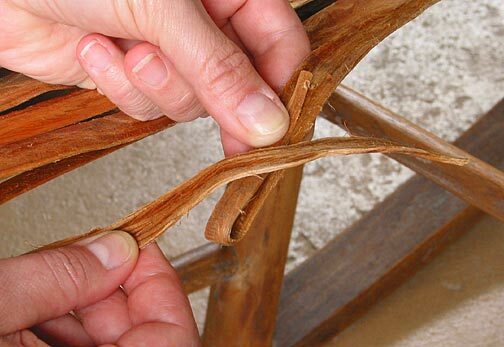 Take the bark that's already in the seat and fold the trimmed end upward forming a small loop. Lay the new piece across the folded end of the old piece. Face the curled (concave) side of the new piece up - just like the old piece. Bend the end of the new piece around the back of the folded end of the old piece. Cross the new piece over itself and tuck it into the loop made by the old piece. Pull the weaver's knot tight. One: It is very strong. 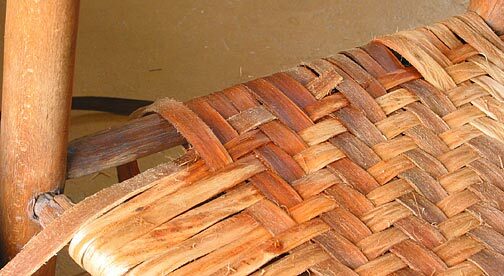 Two: The two pieces of bark are joined with minimal distortion making the later weaving easier. 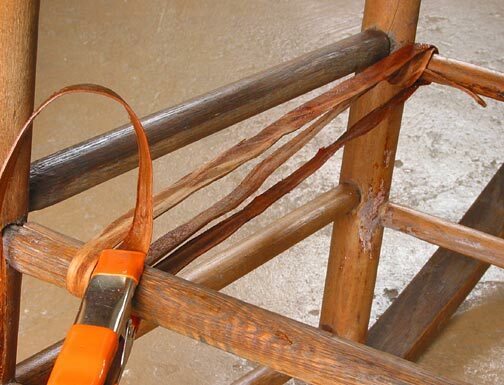 Continue warping your seat from front to back splicing when needed. Keep all of your splices on the under side of your chair and stagger the splices at various distances from the front rail. When you reach the back right corner you may want to let your bark dry overnight. 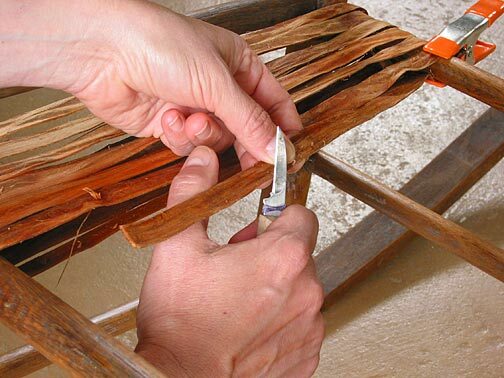 When dry the bark will shrink leaving spaces between each row of the warp and you will be able to slide the bark, one row at a time, toward the left side (where you started the bark) to rid the seat of the spaces. Make sure the bark is still at right angles to the front and back rungs. After making the adjustment just re wet the end of the bark and warp another row or two, filling in the space on the back rung, before continuing. After warping over the back rung for the final time bring the bark to the inside of the right back chair leg (underneath) and over the top of the right rung in the back. The bark will now be at a right angle to your warp. Note: Many old-time chairs have spaces between the warp rows. Apparently the chair seater did not take the time to let the bark dry and those seats have lasted many, many years. The choice to let the warp dry and then put in another row or two is left to you. Check that the warp is damp, spraying it top and underneath with water if needed. For the weft you'll weave only the top warp pieces then turn the chair over and weave only the underneath warp pieces. 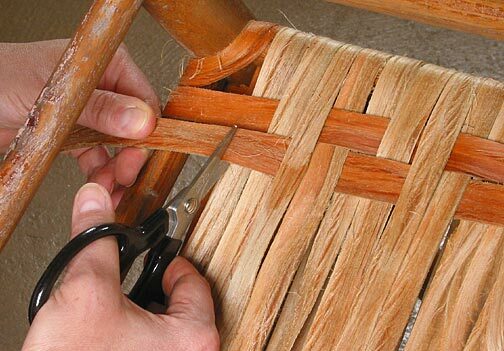 Start the weft of your chair by weaving over 2 warp pieces and under 2 warp pieces near the back of your chair. Use this pattern across all the pieces of your seat. Pull the bark snug when you have reached the left side. Remember not to pull too tightly as this will distort the side rungs. Note: As you weave by twos your weaving may not finish on the side as an over 2 or under 2. This will not matter; just make sure you have counted correctly - by twos - as you weave across. 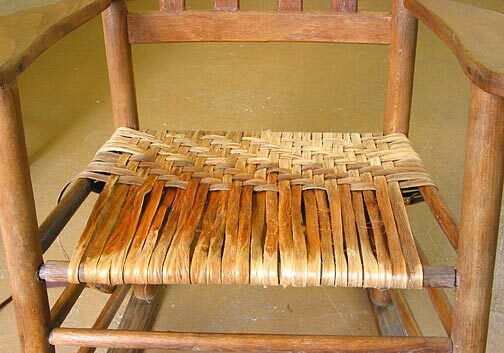 Turn your chair over and weave the under side in the same manner. Starting on the right side, weave over the rung then weave over two and under two across the under side warp pieces. Pull the bark snug. 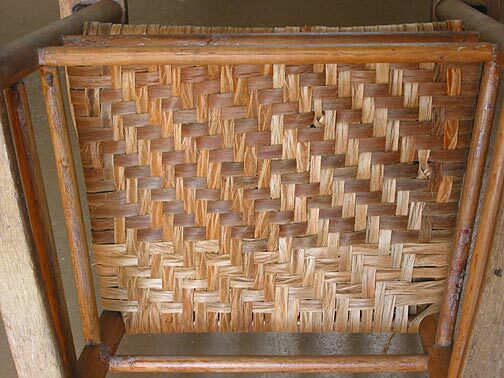 Turn your chair back to the top and start your second row by weaving OVER 1 then under 2 and over 2, under 2, over 2, etc. until you reach the other side. 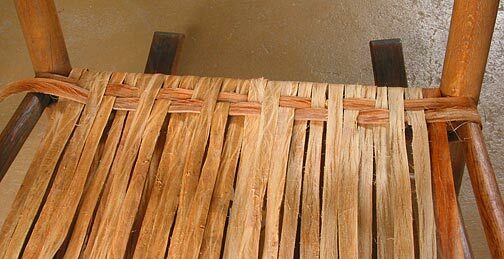 Pull your bark snuggly and position the second row of weaving to touch the first row. Do your best to keep the weft at right angles to the warp. Hint: The warp is looser near the middle of your seat, so do your weaving in this area. Slide the new piece so it touches the previous row and pull until snug. Use your fingers or a packing tool to help push the rows together. Splicing the weft on the under side: When your weaver runs out, cut the end so it falls on top of two of the warp rows. This cut should be at least half way across the under side of the seat; a shorter cut is not as strong. Remember, you should put all your splices on the under side of your chair. Slide a new piece of bark over the end of the old bark matching the weaving pattern of the old piece. Overlap the two ends across 4 or 6 rows of warp. Stop the new piece of bark so it is completely under the warp rows and the end is not visible. Double check that the added piece of bark is concave side toward the inside of the seat. Row 1: Over 2 and under 2, etc. Row 2: Over 1, under 2 and over 2, etc. Row 3: Under 2 and over 2, etc. Row 4: Under 1, over 2 and under 2, etc. The pattern will now start to repeat: Row 5 will be the same a row 1, row 6 will be the same at row 2, etc. 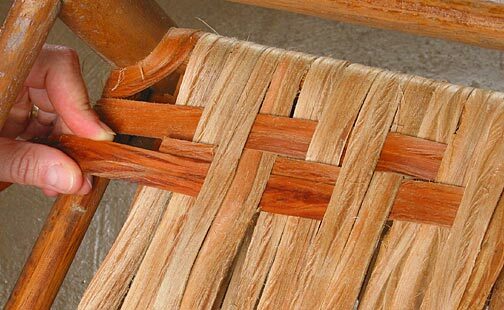 As the weave gets closer to the front of your chair, you will need a bone folder or dinner knife to help with your weaving. Slide the bone folder under the warp. Now slide the end of your bark onto the bone folder. Pushing with one hand and pulling the bark and the bone folder with the other hand you will be able to make each 'stitch'. 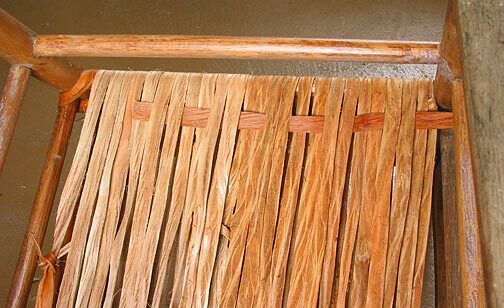 Filling the side spaces: When your weaving is about 4 or 5 rows from the front rung it's time to fill the side gaps on the front rung. The size of the space determines how many pieces of filler you'll use. If you need pieces of a certain size, just trim the edge of the bark to the width needed. 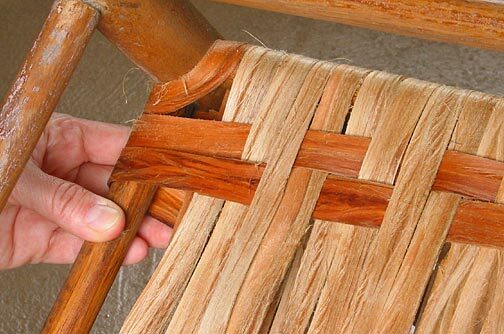 Find a scrap of bark (or cut a length from a longer piece) that is about twice the length of your chair seat front to back and, maintaining the same twill weave, weave the scrap from the front to the back in the space. Eventually the pattern "runs out" and you'll end this piece by just tucking it into weaving and hiding the end. You do not have to weave all the way to the back of your seat; in fact, the sloping side rung will get in the way. Just stop weaving when you run out of room and hide the end under the weft. 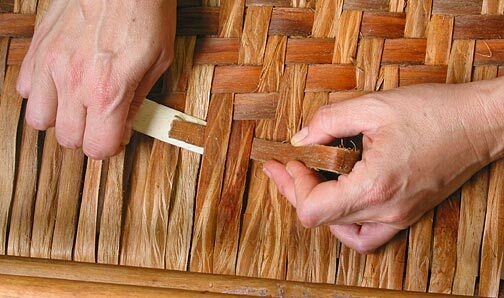 Turn your chair over and weave the filler piece from front to back, following the existing pattern and hiding the end. Continue adding side filler rows until the gaps are filled. 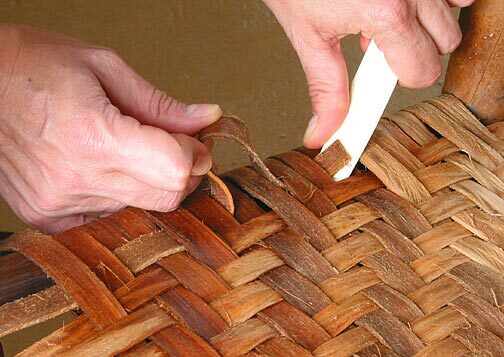 After filling in the side gaps, continue weaving until the last row touches the front legs. 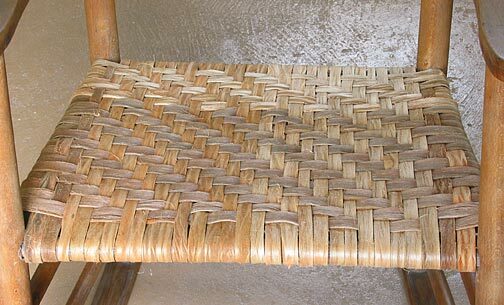 Finish the weaving on the under side of your chair, hiding the end under the warp near the middle of the seat. This photo shows the side filler pieces. A look at the completed under side of the seat. Close up view of the under side showing the weavers knot splices covered with the weft. Sometimes you may have to change your pattern when you come to a weaver's knot splice. This is not a problem, just be creative and do a neat job. 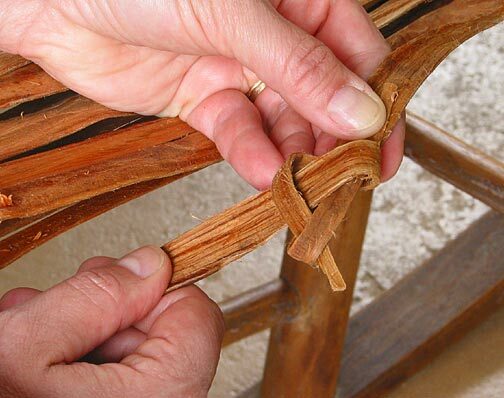 As you warp a chair seat the flat reed will need to be spliced. 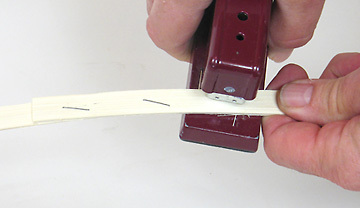 Here is a very simple method using a household/office stapler. Keep all your splices on the under side of your chair seat. Overlap the flat reed about 4 to 6 inches. The smooth side of the reed of both pieces are facing 'up' in this picture. Staple the two pieces together about 4 or 5 times. Turn the pieces over and squeeze the sharp ends of the staples with a pair of pliers. This will prevent the ends from 'catching' as you continue weaving. The ends of the staples will face to the inside of your chair seat. This means the rough side of the flat reed will also be facing to the inside. When the seat is finished, any staples that are showing may be removed if desired. 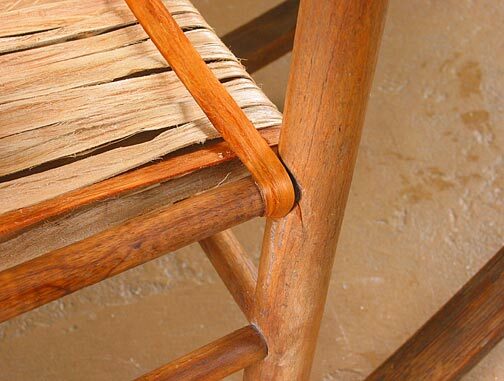 Note: The splices in the weft of the chair seat do not need to be stapled.